Home / Derby in the Kitchen / Macro-Fueled Munchies! So, what did I learn while Fitting My Macros? Planning pays off! As with my other dietary experiments, I needed to have a good sense of what I planned to eat through the week to make sure I was hitting my targets. To review, I was aiming for 46% carbs (192 g), 28% fat (52 g) and 25% protein (104 g) per day. This was my first kick at the can with the IIFYM suggested macros, so I didn’t make too many adjustments to the way I normally eat. As such, my fat intake was a little high and my carb intake was a little low. Also, I had a beer with dinner today. It quickly eats up some of your calories and carb intake (while giving you little nutritional benefit), but IIFYM does allow you to be flexible about things and booze is one of them. Day 2: Total Calories: 1764 Macro Breakdown: 176g carbs (47%), 56g fat (33%), 74g protein (20%) – Had to eat carb-y snacks to get close to my carb targets. I worry that living by the numbers might be encouraging me to ignore my natural hunger (and satiety) signals. Still lots of time to see. Day 3: Total Calories: 1433 Macro Breakdown: 137g carbs (47%), 31g fat (24%), 83g protein (29%) – I was on the go all day today, and could not actually find the time to eat as many calories as the program wanted me to – lesson: plan ahead. Day 5: Total Calories: 1887 Macro Breakdown: 207g (52%), 52g fat (29%), 74g protein (19%) – Today, I skipped my protein shake. I will not skip my shake again. Day 7: Total Calories: 1130 Macro Breakdown: 94g carbs (39%), 36g fat (33%), 68g protein (28%) – Day 6 and 7 were at a tournament and I did not eat enough, nor did I bring enough protein-rich snacks. I was not super meticulous about perfect numbers for most of my day. As such, I found myself strapped for specific calories every evening. This was a challenge for me, since I really only wanted to eat when I’m hungry, rather than just eating to make sure I “hit the numbers”. Measuring portion sizes is a pain, but is necessary when you’re trying to be accurate about your intake, it’s a must. Invest in a food scale, and also use this “handy” guide from Precision Nutrition. Don’t be afraid of little indulgences, but try to keep the 80/20 rule in mind. If you’re going out to eat – make sure that you’ve adjusted your other daily meals accordingly. You’ll notice that I included a beer in there to show that you can drink alcohol on this plan (and strictly for that scientific purpose, I’ll have you know). When adding alcohol into your macro planning, keep in mind that it has 7cal/g (unlike any of the other macros). You can substitute it for some of your carb grams or fat grams, but keep in mind that you are deriving none of the nutritional benefit from booze that you would be gaining from alternate sources. I, like Lippy, am a notorious skipper of meals and this plan allows for more flexible nutrient timing. This suited me just fine, but can become problematic when you are eating for performance. It’s important to remember that we need to fuel our activities in a sensible way – if you know you have a practice or game, you need carbs and protein to be able to perform, and simple carbs in order to recover afterwards. Here’s a really good article that breaks down why IIFYM doesn’t always work for athletes. The short story is that because IIFYM doesn’t give any guidance on WHEN to eat which macros, adherents might be getting the right things at the wrong time or “saving” calories to use for indulgences while robbing themselves of better performance. There aren’t really IIFYM recipes, per se, since any recipe could potentially fit your macros. That said, you can find ways to make your favourite recipes more macro compliant, for example: adding protein powder to your baking, tossing some flax seed or nuts into your salads and dishes to increase your healthy fat intake, or serving meals on or with greens to up your fibrous carbs. 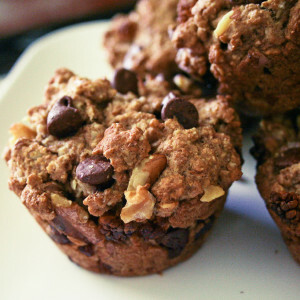 PB Chocolate Chip Oatmeal Muffins. Preheat oven to 375 F. Line or grease muffin tins. Mix oats, baking powder, salt, and chocolate chips in a large bowl. In a small mixing bowl, whisk until combined peanut butter, milk, egg, and sugar (I found that It’s hard to blend peanut and milk so I whip it in the blender for a minute). Add the wet ingredients into the dry ingredients and stir well to combine. Using an ice cream scoop, fill each muffin well. You may need to press down on the mixture a little to get the air pockets out. Bake for 30-35 minutes, or until the muffins are golden brown on the top. Remove to a cooling rack and cool completely.